Anthimeria is the formal term for when a word is used as another part of speech – what happens when nouns are verbed (and vice versa), when adjectives slide into noun- or verb-hood, when nouns get stacked adjectivally onto other nouns. Mrs. Badcrumble probably told you not to do it. You probably do it anyway. And well you should. Anthimeria is part of the play of language change that makes English vital and alive. It was a major force in Shakespeare’s wordplay toolkit (from the lowly gravedigger’s “Cudgel thy brains no more about it” in Hamlet to the Duke of York’s “Grace me no grace nor uncle me no uncle” in Richard II), and remains indisepensible to the way we navigate the shifting landscape of technology and information – like the way the adjective in text message becomes a noun when we send a text, and is then further verbed to the concise, efficient text me. It’s not always elegant; we might cringe a little when managers talk about liaising and leveraging (though we must admit, we also know precisely what they mean), but a few missteps are worth the joy of seeing a living language grow and adapt. Because adapt it surely will, and no amount of standing athwart it yelling Stop will do any good to halt the millions of speakers who make English do what they need it to do, and serve the purposes they need it to serve, in their day-to-day lives. For living things, adaptation is survival, and repurposing existing parts for new uses is a highly successful survival strategy. Language scolds and grammar cops like to imagine a time when English was pure and perfect – usually thirty or fifty or a hundred years ago – but even if we accept that it was (it wasn’t), the world of those times didn’t know it would someday need to describe a telecommute where you receive a download that you later save to the cloud. The kinds of language change illustrated in that one scenario – portmanteau, anthimeria, semantic shift – have happened, and continue to happen, because we need new linguistic tools to match our physical (and virtual) ones. Galileo may not have actually said eppur si muove, at least not where the Inquisition would have heard him, but it’s a good tale anyway and a good model for lovers of language. We might not approve of every vicissitude English undergoes, but it doesn’t ask for our approval; and yet it changes, will we or no, so we might as well study its movements with curiosity and inquisitiveness rather than judgment or sorrow. “In street English, anthimeria runs rampant,” wrote professional wordsmith Nancy Friedman a decade ago (adjectivizing street in a way that even Shakespeare wouldn’t have immediately recognized), speaking fondly of a host of colorful colloquial repurposings. And of course, we’ve also rung a change on rampant too, from the days when it was a word that described the upright, aggressive, slightly off-balance attitude of heraldic beasts like the gryphon that sits atop the sidebar. That strikes me as not a bad image for the English language: a fantastical creature made of composite parts, whose name isn’t even spelled the same way consistently, magnificent and terrible and the stuff of endlessly inventive stories. (Story isn’t merely one of the functions of language, after all; story is what language is.) We do it the most honor by telling its tale not as a lament for a golden age now lost, but as one that looks forward with hope and wonder, marvelling at what it might become next. 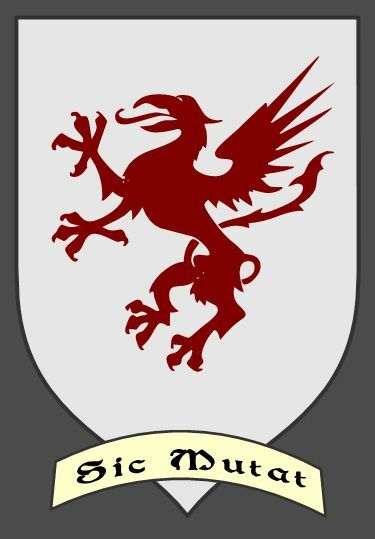 Which I am at pains to point out is not strictly rampant, at least according to the fine points of heraldic blazon, but segreant, a term reserved for the rampant attitude in fantastical creatures such as dragons and gryphons that have four legs and wings. There, how’s that for peevery?